On March 9, the University of Chicago will host a memorial service honoring the memory of Wayne Booth (1921-2005). The service will take place at Rockefeller Memorial Chapel (1156 E. 59th Street), from 4:30 PM to 6:00 PM. Wayne Booth wrote some of the most influential and engaging criticism of our time, most notably the 1961 classic The Rhetoric of Fiction, a book that transformed literary criticism and became the standard reference point for advanced discussions of how fiction works, how authors make novels accessible, and how readers re-create texts. This May, the University of Chicago Press will publish The Essential Wayne Booth. 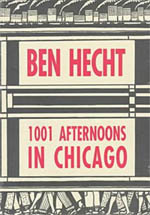 Read an excerpt from For the Love of It: Amateuring and Its Rivals. . . .
On February 28, 1894 Ben Hecht was born in New York City. Though he would find fame as a novelist, playwright, and screenwriter, Hecht was at heart a news reporter. His columns for the Chicago Daily News were collected in the 1922 book, A Thousand and One Afternoons in Chicago, a timeless classic of journalism. In 1925 Hecht went to Hollywood to try his hand at screenwriting. He wrote more than seventy screenplays, including Underworld (1927), for which he won an Oscar. He returned to his newspaper roots when he collaborated with Charles MacArthur on The Front Page, a play based on his adventures as a newsman, which became an enduring hit. . . . In The Nature of Paleolithic Art, Dale Guthrie overturns many of the standard interpretations of the ancient cave paintings of the Paleolithic era. Among other things, Guthrie argues that many of the cave paintings were done by children and have similarities with present-day graffiti. Here is an illustration and short excerpt from the book: Missing Fingers in Art: Ritual, Disease, Frostbite, or Kids Playing? 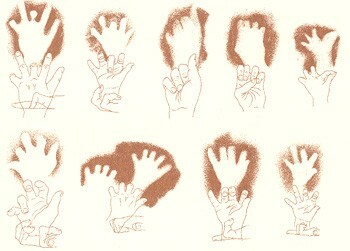 “Many hand images in the French Gargas-Tibran cave complex and Cosquer and in Maltravieso Cave in Spain appear to have missing fingers or other malformations. These “disfigured” hands have fueled discussions for the last 100 years. Groenen (1987) has provided a review of this debate. The central issue, of course, is that virtually all apparent mutilations are also replicable by simply contorting fingers in the stenciled hand (as one does in shadow art). But many people still insist that these represent real ritual amputations. “More recent speculation on possible causes of these disfigured hands has focused on Raynaud’s disease, in which capillaries fail to respond normally by flushing with warm blood when hands or feet get cold. I find this explanation unconvincing, because Raynaud’s disease is seldom expressed in young men (Larson 1996), and the hands . . .
Why is the slapstick comedy of the Three Stooges funny? Why do we laugh when the Black Knight gets his arm hacked off in Monty Python and the Holy Grail? Paul Lewis, author of the forthcoming book, Cracking Up: American Humor in a Time of Conflict, recently discussed the appeal of violence in comedy on NPR’s Studio 360. In a Studio 360 segment called "Why Are You Laughing?," Lewis compared violent comedy to a roller coaster: "As you make your way up there’s a sense of apprehension. Will this be dangerous? Will it be thrilling? As you’re on your way down you’re either screaming or you’re laughing or some combination, which is familiar to people who enjoy sadistic or cruel humor." Listen an audio file of "Why Are You Laughing?" on NPR’s Studio 360 Web site. Cracking Up: American Humor in a Time of Conflict will be published by the University of Chicago Press later this year. . . . Choice: Current Reviews for Academic Libraries recently reviewed David Schmid’s Natural Born Celebrities: Serial Killers in American Culture: "Schmid’s intriguing book thoroughly investigates the ‘celebrity’ serial killer phenomenon that has made killers like Jack the Ripper as famous as any movie star. Schmid explores how and why serial killers have obtained fame, the consequences of that fame, and what the killers’ celebrity status says about the roles that violence and fame play in culture. 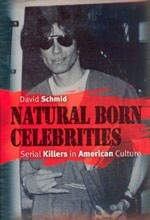 The subject matter is well researched and organized.… By examining the public fascination with serial killers, Schmid forces readers to confront their own roles in the creation of ‘celebrity’ serial killers and the public interest that generates celebrity status." 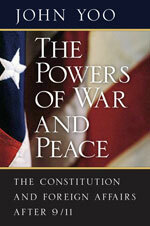 Read an excerpt. . . .
John Yoo, author of The Powers of War and Peace: The Constitution and Foreign Affairs after 9/11, was interviewed by Steve Inskeep on NPR’s Morning Edition this morning. Yoo explained his view of the president’s expansive power in times of war, and the role of Congressional review and oversight. He also said that it’s “an exaggeration” that his views give the President “unlimited power.” We also have an interview with Yoo on our website. . . . Earlier this week, Robert E. Wright talked to NPR’s Cheryl Glaser about his new book The First Wall Street: Chestnut Street, Philadelphia, and the Birth of American Finance. When Americans think of investment and finance, they think of Wall Street—though this was not always the case. During the dawn of the Republic, Philadelphia was the center of American finance. The first stock exchange in the nation was founded there in 1790, and around it the bustling thoroughfare known as Chestnut Street was home to the nation’s most powerful financial institutions. The First Wall Street recounts the fascinating history of Chestnut Street and its forgotten role in the birth of American finance. An audio file of the program is on NPR’s Marketplace Web site. 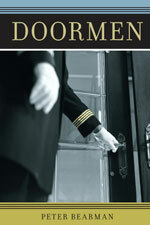 Read an excerpt. . . .
Last week, Forbes interviewed Peter Bearman, author of Doormen. Combining observation, interviews, and survey information, Doormen provides a deep and enduring ethnography of the occupational role of doormen, the dynamics of the residential lobby, and the mundane features of highly consequential social exchanges between doormen and tenants. From the Forbes interview: To me, money is…Because I am a sociologist, I conducted a survey to get the answer to this question. Twenty-three percent of my respondents said that money was a "mixed blessing." Eleven percent thought that money was "potent." The rest of the people I talked to—pretty much everyone in New York City—thought that money is always a better choice than cookies for their doorman’s holiday bonus. Read more about the Christmas Bonus in an excerpt from Doormen. 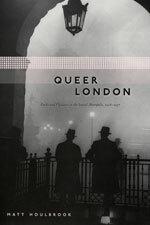 Read the New Yorker feature on Bearman and Kieran Healy’s review of Doormen. . . .
Matt Houlbrook’s Queer London: Perils and Pleasures in the Sexual Metropolis, 1918-1957 has received the Longman-History Today Book of the Year 2006 award. 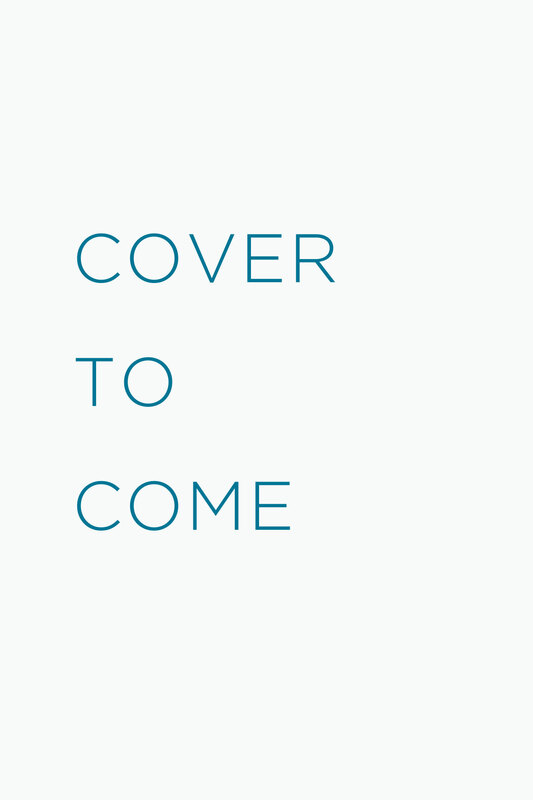 History Today Editor Peter Furtado described it as "not a story of persecution, but a lucid, sane and fascinating account of how gay people negotiated space for themselves within a hostile cultural environment, dealing with policing, housing, geography, identity and politics." The current edition of the Times Higher Education Supplement features a review of Queer London by Matt Cook: "A ground-breaking work. While middle-class lives and writing have tended to compel the attention of most historians of homosexuality, Matt Houlbrook has looked more widely and found a rich seam of new evidence. It has allowed him to construct a complex, compelling account of interwar sexualities and to map a new, intimate geography of London.… There is a nostalgia here for a world lost. This brings a rare warmth to the book: Houlbrook has a genuine affection for the men and places he describes. Occasionally his spectacles feel just a little too rose (or lilac) tinted. He is right to suggest that some of our understandings of queer life have narrowed since the war, but I find it . 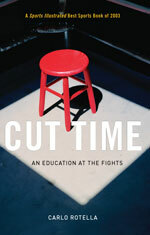 . .
Carlo Rotella’s Cut Time: An Education at the Fights, chronicles his immersion in the fight world, from the brutal classroom of the gym to the spectacle of fight night. Cut Time was recently reviewed in the Columbus Dispatch: "Like venerable boxing writer W. C. Heinz (The Professional), Rotella studies the ring event to discover its meaning rather than burying it under a load of preconceived significance in the manner of Norman Mailer (Advertisements for Myself). Even so, Rotella remains aware that fight writing is not primarily ‘an account of what happened’ but ‘an expression of what a fight or fighter means to a writer.’" Read an excerpt. . . .